Dart goes to Hillman Hospital in search of the missing SuperPatriot and is accompanied by Ricochet and her daughter, Sharona. There is no trace of the hero having been there or even of Justice being admitted as a patient and lapsing into a coma. Dart suspects that a cover up has taken place which lends to the theory of SuperPatriot’s that the Covenant of the Sword was involved. She had been briefed by her teammate before he set off in search of Liberty and is determined to find out the truth. Ann Stevens treats the wounds inflicted upon Debbie Harris when she crashed through a window into Dragon’s living room. Her patient slowly starts to regain consciousness and immediately delivers a warning regarding the Gods. Thor has gathered some of the Gods stranded on Earth together and they are planning to claim a new home for themselves and the rest of their kin. The underwater city of Atlantis is going to be raised to the surface and its current inhabitants disposed of. At the complex of Chicago’s branch of the S.O.S., Dragon is informed that he cannot borrow any of their aircraft to take him to the coast. Stephenson has laid down strict rules that should he want anyone getting involved in the situation then he will dispatch the primary away team from Washington. Sgt. Marvel is informed of the attack by PowerHouse but takes the opportunity to inform Dragon that it is about time that someone clued him in. Dragon’s desire to challenge the Vicious Circle is ill-advised as they are hopelessly outnumbered and other ideas should be explored. Dragon demands to speak with Stephenson and a video conference is soon set up where the government official explains that there are plans in motion regarding the Gods. Stephenson refuses to listen to pleas to get involved and demands that Dragon remain in Chicago. This directive is ignored and Dragon secures Horridus to watch over his daughter. He then enlists Mighty Man to transport him to the coast but approaches the S.O.S. for volunteers to accompany them. She-Dragon jumps at the chance, hoping that the Eternal Youths may be present so that she can finally be reunited with them. Later at the coastline, Thor rallies up his followers to prepare to seize their new homeland but is interrupted by Dragon. He recognises this interfering mortal from their past encounter on Godworld and is uninterested in his words regarding sparing Atlantis. Thor sees the Atlantean race as insignificant and even if his action exterminates their race he believes that it is worth it as long as the Gods get a new home. Dragon makes one last gasp effort to get Thor to change his mind but the Thunder God rejects it before launching an attack upon the hero. A group of heroes consisting of She-Dragon, Mighty Man, Vanguard, the Deadly Duo and Brute Force reveal their presence and leap into action to defend Dragon. The fight is joined by the legions of Gods as Mighty Man attempts to protect Dragon. His fighting skills are called into question as Thor beats him down with surprising ease. As the fight rages on, the mystical Czhenriblich casts a spell that causes Atlantis to rise up on a huge pillar. The Gods begin slaughtering the fleeing Atlanteans as they desperately try to get back into the ocean and the heroes do their best to save them. 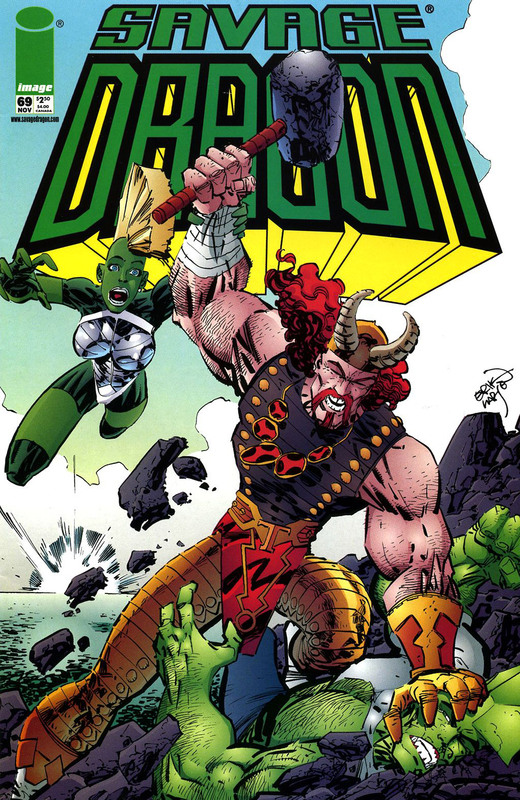 Thor continues to pummel Mighty Man with his hammer but Dragon wrenches the weapon from his grip. The sheer power contained within Miolnir causes half of Dragon’s torso to burn to cinder, along with one of his arms and his fin. Dragon lies near death as Thor explains that even he cannot hold his hammer without his magical gauntlet. Thor prepares to deliver a killing blow to his fallen opponent but Mighty Man begs him to stop, confessing his love for Dragon. This declaration from the seemingly male hero shocks many of those fighting around them. Thor shrugs off this confession and grabs a hold of Mighty Man, ready to kill him too. His arm is suddenly gripped by a powerful arm that snaps it backwards, badly breaking the limb as Zeek announces his presence. The S.O.S. has arrived on the scene and Rock quickly calls off Zeek before he causes any more harm to Thor. He then demands that the heroes depart and leave the Gods to take up residence in their new home, something that enrages the barely conscious Dragon. It becomes obvious that Stephenson wanted this conquest to occur as it removed both a hostile nation in Atlantis whilst also resolved the issue about housing for the thousands of Gods stranded on Earth. Kill-Cat airs his annoyance that the Gods are being allowed to simply leave but Rock shuts him up by announcing that if he could prove it was him the day that was present when Rogue Warrior killed three of his men that he would arrest him right now. Dragon’s disgust with the whole affair causes him to ask that Mighty Man take him far from there. Dragon is soon recovering in Hillman Hospital where She-Dragon laments that there was no sign of the Eternal Youths at the battle scene. Debbie thanks Dragon for at least trying to save Atlantis before everyone is asked to leave so that Dragon can talk to Ann alone. Alex Wilde arrives to visit her friend and former lover but as she goes to enter his room she catches Dragon and Ann embraced in a passionate kiss.